Whitman is privileged to have first-class athletic facilities for anyone who would like to use them, including the Multi-Purpose (MP) Gym in Sherwood Center. 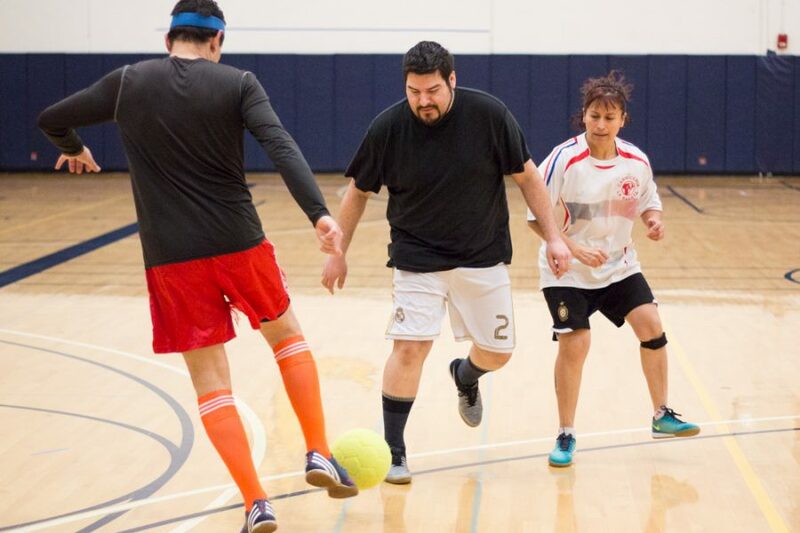 While many groups from Whitman and the Walla Walla community take advantage of this open and recreational space, the “Noon Soccer” group might have been the ones who started it all. 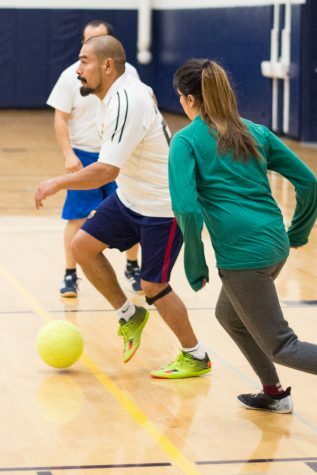 This group of professors, faculty, students and community members meet every Monday, Wednesday and Friday at around noon during everyone’s lunch to play pickup soccer in the MP Gym. Kurt Hoffman, a Whitman physics professor, is the Whitman-sided representative and organizer for the group. Hoffman hasn’t always been a soccer aficionado, but he was inspired by his kids to get into the game. “I used to play indoor basketball, but I started playing soccer when my children started playing. They originally started playing in a city rec. league, and so eventually after coaching and helping them for many years, I started playing with this group. I have maybe been playing here for about eight years, but this group has been playing here since the ‘90s,” he said. The players are made up of Whitman faculty and staff, Whitman students and members of the Walla Walla community. The diversity allows for a good range of ages, skills and commitment levels. “We have a good mix of people: a lot of older guys who know how to play the game and the younger people bring a lot of energy. A lot of these guys grew up in Central and South America, and they have a lot of experience playing. I learned most of what I know about soccer from those guys and playing with them,” Hoffman added. The convenience and accessibility of the MP gym is not lost on the group either, and having a reserved enclosed space can help with weather problems, as well as the actual play with a pickup style attendance. Victor Alana, a community member who has been playing with this group since 2000, appreciates the welcoming space of the Multipurpose Gym. “[The MP Gym] is great because in the summer it’s hot and there is A/C, and in the winter there is snow and you can be warm, but one of the main reasons for me is you need less people. To play outside, you need at least 15 people, but in the gym, you can have a great time with five or seven,” he said. While some healthy competition is always present, the emphasis of the group is having fun and appreciating the openness and unity that a simple game of soccer can bring, all while getting some exercise in along the way. “The main reason I am playing is a wellness program for my health, because being here and running for an hour, I forget about work and get all the worries out of my mind. Everybody is here for fun,” Alana continued. Whitman’s women’s soccer coach Laura Williamson found and joined the group after simply walking by the gym at the right time. “The ball moves fast and most times with a purpose, so it’s always a good workout. The environment is welcoming and friendly–people compete hard, but they laugh just as hard as well. This is a group of purists who play for the joy of the game,” Williamson added. Whitman students have also taken advantage of the friendly community, including sophomore Nikhil Solomonson. “It’s pretty awesome, I can just bring my friends and they’re always accepted. It shows how powerful soccer can be in uniting groups of people,” Solomonson said. The game of soccer and its ability to bring people together have been around for a long time, and this group has taken full advantage of it. They began playing long before many current students arrived at Whitman. 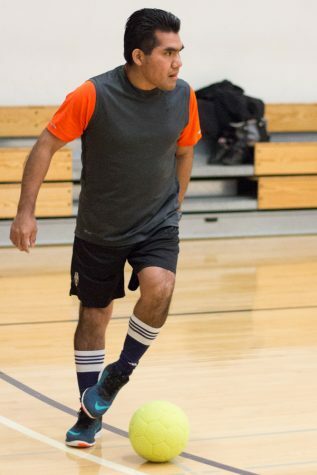 With an easily accessible and welcoming facility like the MP gym, and a group of people looking to treat themselves and their bodies, this “Noon Soccer” group looks like they will keep on kicking. A Round of Applause: Threat to Decency or Deserved Reaction? Crowning a Champion: Playoffs or a Table?